This course covers OSHA policies, procedures, and standards, as well as construction safety and health principles. Topics include scope and application of the OSHA construction standards. 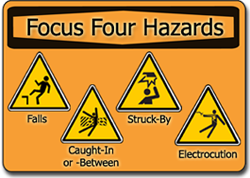 Special emphasis is placed on those areas that are the most hazardous, using OSHA standards as a guide. This course is a prerequisite to the OSHA #500 Trainer Course. This course is also suitable for anyone that wants to gain knowledge regarding the content and scope of the 29CFR 1926 OSHA Construction Industry Regulations. The registration fee for this course includes a printed copy of the 29CFR 1926 standard.